Ive been using this command since Mr crayfish posted this on one of his youtube video, but then in the latest update its NOT working anymore, Ive asked in his post if it has been change or not and still got no reply.. can anyone tell me whats the new one or Im wrong on typing this coz im not good on commands and everytime i type this i always get error saying: "(my name in minecraft) is a player and not an entity"
PLease help!!! Thanks soo much. @e selects entities, you are an entity. You have no filter in there to tell the command to look specifically for the vehicle, so it's just going to use every entity it finds. 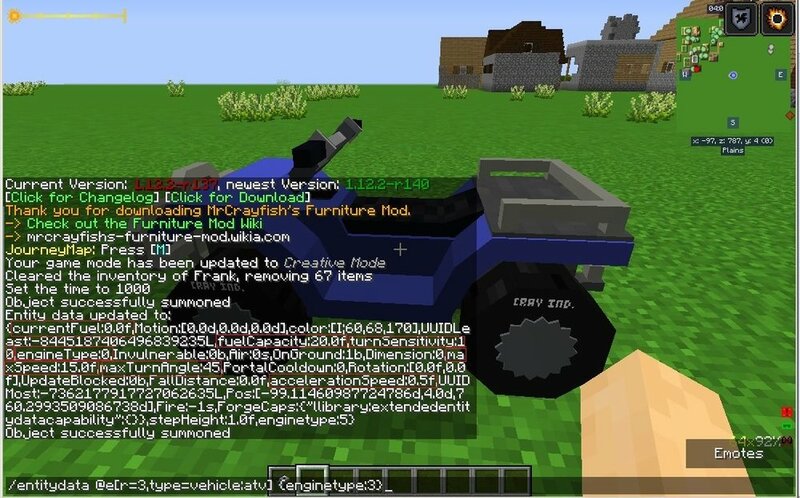 You can use/summon (requires cheats) to look up the actual entity type of the vehicle using the tab completions, once you have that you can use the type= filter for @e.
thanks, using this command I already tried riding on vehicle, and tried just facing it and also tried using command block just like what Mr Crayfish did in his video, first it is working but he just updated it a while ago i think, now its not working so how am I going to type it in, is it like: /entitydata @e:type= or please sorry i really dont know. ok I will try this thank soo much!! nothing happened but only got this on the screen.. When the entity data changes successfully it vomits all of the entity's NBT data into chat. I assume that's what's happened here but that link is a 404.
oh sorry for the link. I think that text is successfull right??? The thing is a lot of the tags are nested and case sensitive, for instance I see you using enginetype but elsewhere in the original data I see engineType, and I also see some other stats that are in the NBT that may or may not change when you change the engine using this method. ugh! this going too hard now, so you mean i need to include NBT but how, well I will try summon the vehicle and change the engine before using it I think and try to hold a new engine that im going to insert in the vehicle in my hand. Maybe this will not affect the NBT i hope. here it shows the engine speed Not changing the engine yet. after executing that command...speed still the same. can you tell me really how to make things right? I also see some other stats that are in the NBT that may or may not change when you change the engine using this method. And again I must mention that these are case-sensitive, so far I haven't seen a before and after with the correct capitalization used.